In the mean time, I’m working on the appendices: sample characters, worksheets, cheat sheets, etc. The main item I still have work on is a short collection of one-page adventures and a step-by-step demonstration of how to create these. I’m using Ryan M. Danks’ Fractal Adventure method, with kind permission. I already have a chunk of writing on this in the draft and I suspect I won’t have the word space to expand much more, but I wanted to show every step and here is as good a place as any. Brace yourselves for a long post. It’s also structured a little oddly because I’m skipping some context material; bear with me, it flows more smoothly in the book. 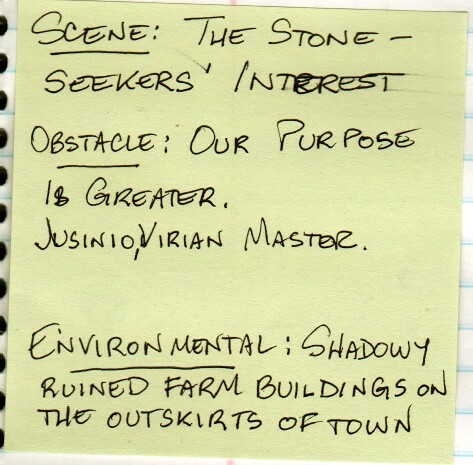 Because Iva has the aspect Sponsored by the Stone-Seekers and Rustica has Owes Valius Nummus a Favor, it implies that their patrons have their own agendas. Therefore, Iva and Rustica both agreeing to find the same Ancient artifact, the Mask of Kuldarus, and bring it back to their respective sponsors would probably be a big problem for them. 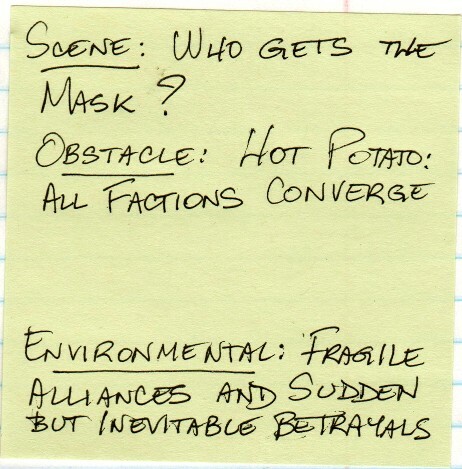 Some questions immediately pop to mind because they are implied in the choice of aspects used to create the problem: Will Iva get the mask for the Stone-Seekers? Will Rustica repay Valius Nummus? These are the questions we will be answering by the end of the scenario. In order to get there, we have to answer some other questions. We’re reasonably confident that both Iva and Rustica will be interested in finding the mask, but Will Rustica agree to bring the mask back to Valius Nummus? If the answer is “no” right at the start, then Valius Nummus might decide to force the issue through some other means—persuasion, blackmail, threats—or he might try to locate the artifact himself, or hire a rival team. Will Iva and Rustica share with the group the requests their respective sponsors have made? Perhaps one or both will choose to keep it a secret. And if they share the information, Can the PCs come to an agreement on what to do with the mask? This might take the whole adventure to resolve, or they might immediately decide that one faction has better title to the prize. Do the heroes know where to find the mask? If not, then that’s probably a chunk of the adventure right there, finding out the artifact’s whereabouts. This is a good place in the adventure to use Rustica’s scholarly abilities, Iva’s arcane connections, and Ulf’s mundane ones. And Can they get there? Sometimes getting there is half the fun. Or all the fun. The players have shown interest for lost islands and sea adventures, and this will hook Ulf into the scenario, so Kim decides that there must be a sea voyage to a dangerous location protected by teeth-like reef formations and treacherous breakers. Is there a reason neither the Stone-Seekers nor Valius Nummus already obtained the artifact? There must be great difficulties in recovering the mask, otherwise it wouldn’t be an adventure. Difficulty of access, dangers, guardians, even magical protection shield the mysterious artifact. Is there a reason to search for the mask now? 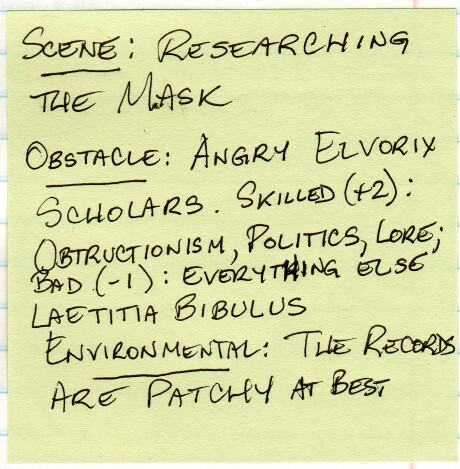 If the group prefers to limit the amount of investigation in a given scenario, then perhaps a manuscript has just been discovered which talks about the location of the mask; that way, the problem is reduced to obtaining a look at the manuscript and deciphering it. If on the hand the players love investigation but tend to dissolve into analysis paralysis, perhaps the clock is driven by the fact that a rival team—say, Laetitia Bibulus’ and the Seal of Prolyus—is already on its way to retrieve the mask and put it to ill use. Do the PCs know what the mask’s properties are? There is ample room for secrets and surprises. What does the thing do? Under what circumstances? Is Valius Nummus friend or traitor? To what ends does he wish to acquire the mask? They want to investigate their way through? They want to fight their way through? They want to negotiate their way through? They want to sneak their way through? Jot down your answers for later use. As a rule of thumb, if you can’t think of at least two or three ways to get the job done, then your scenes or adventure may be too narrow. 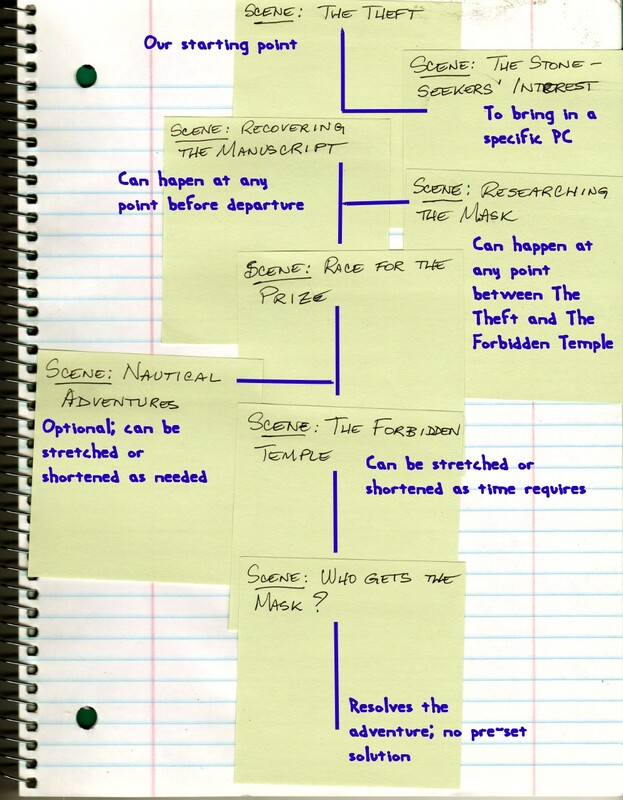 Here is an optional method for writing scenarios called Fractal Adventures, which relies heavily on the Bronze Rule of Fate. 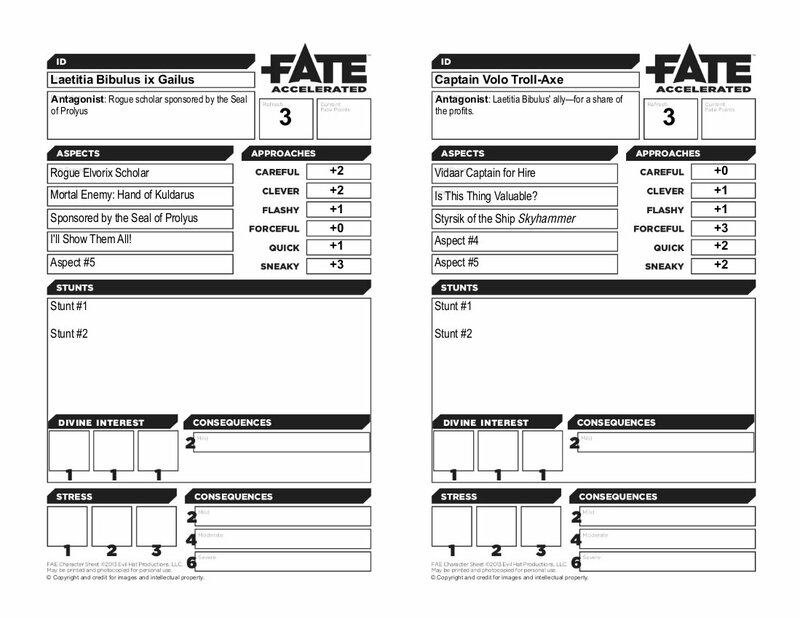 It was created by author Ryan M. Danks, and a more detailed discussion of the method can be found in the Fate edition of Ryan’s game Jadepunk: Tales From Kausao City (Reroll Productions). 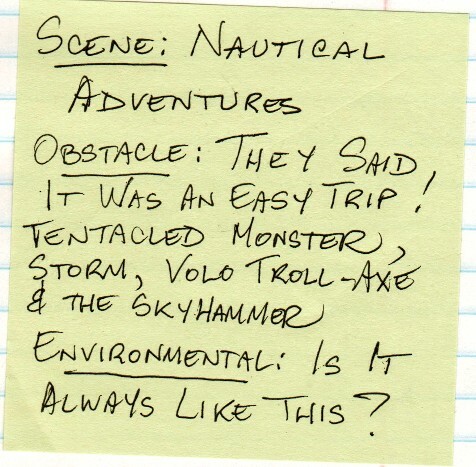 Writing an adventure should take about 20 minutes, assuming you already know what the story will be about. First, you need a goal; the problem(s) we discussed earlier work well here. What is it the PCs want? Create an aspect to represent the goal; you can call it the adventure’s high concept. Once you know the goal, decide whether or not the PCs will obtain their goal—“maybe” is a sufficient answer here, relying on the PCs to determine success or failure on their own. It isn’t always necessary that they succeed, however, as failure leads to more adventures. How will you make it inevitable that the PCs will act toward that goal? To keep tension as you move from scene to scene, create a trouble aspect. This should represent the danger or death that’s overhanging in the adventure; again, if there’s no chance of physical, psychological or professional death at all times, there is no tension, which means a boring game. The trouble is what happens if the PCs ignore the adventure, and also what will step in from time to time and remind them why what they are doing matters. The PCs must locate and retrieve this item to prevent it from falling in the wrong hands. Trouble Overhanging: The Seal of Prolyus Is On the Trail! 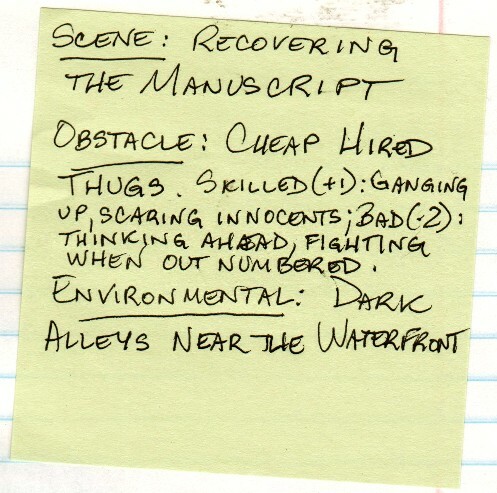 Once you have your goal, work backwards to create the scene list—scenes are where players get to play; without them, you have no game. This is where your list of story questions comes handy. What steps will the players need to take to achieve their goal? To bring a killer to justice, they might first have to discover his whereabouts, which requires discovering who he is, which may require questioning witnesses and following clues, which requires investigating the crime scene, which requires being alerted to the crime. Read that backwards and you have your scene list: hear about the crime, investigate the scene, talk to witnesses and follow clues, discover the killer’s identity, discover his whereabouts, take him down. While reading this list, you might decide to increase the tension somewhere in the middle. Maybe a witness turns up dead, too—or a fight ensues between a masked killer and the PCs as they arrive just before a witness is murdered. This is logical, as the killer would want to throw off the investigation. 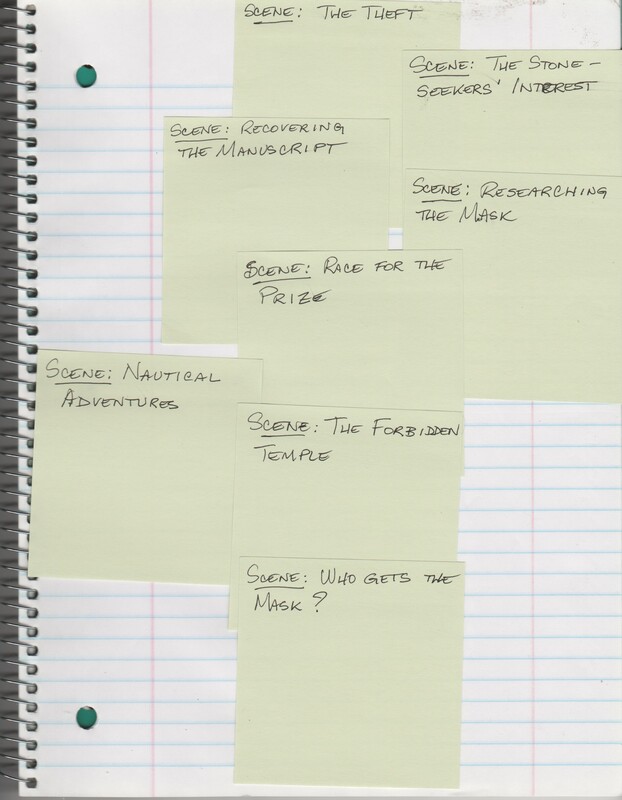 You can mark some scenes as core and others as optional; you can also jot down notes when some scenes need to be played in a specific order. Witness interviews and clue investigation can probably be played out in any order, for example, but the last few scenes may need to happen sequentially. If you know you will be limited by time when you run your game, you can concentrate on the core scenes and watch the clock to decide whether to lead into one of the optional scenes, such as the murder of a witness. 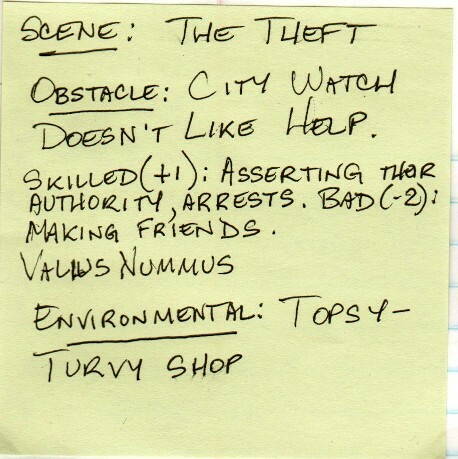 The Theft: Valius Nummius’ shop has been burglarized and the Teran manuscript stolen. Attributed to Tera Bibulus, the manuscript may contain clues to the location of the Mask of Kuldarus. Valius asks Rustica for help retrieving manuscript and mask. Recovering the Manuscript: Discovering the identity of the thieves and getting the manuscript back. Since the thieves used violence, there is probably going to be a physical confrontation. The Stone-Seekers’ Interest: The Stone-Seekers approach Iva and offer help in finding the Mask of Kuldarus, but ask her to bring it back to them, not Valius Nummius. Researching the Mask: The PCs—most likely Rustica—will probably want to do a little background research into the history, location, and nature of the mask. Race for the Prize: The PCs learn that another group is already on its way to recover the mask from its resting place. Set sail! Nautical Adventures: Good time to encounter the rough climate of the World of Agaptus, pirates, sea monsters, and a fight against the rival team. This can become several scenes, depending on how much fun the players are having. The Forbidden Temple: The PCs reach the location of the mask, brave its defenses, and face the competition for possession of the artifact. Who Gets the Mask? : Valius Nummus wants it, so do the Stone-Seekers and the Seal of Prolyus, and perhaps a secret cult dedicated to protecting or using the mask. Some of these factions may be covert allies. Now you can come up with your adventure aspects. 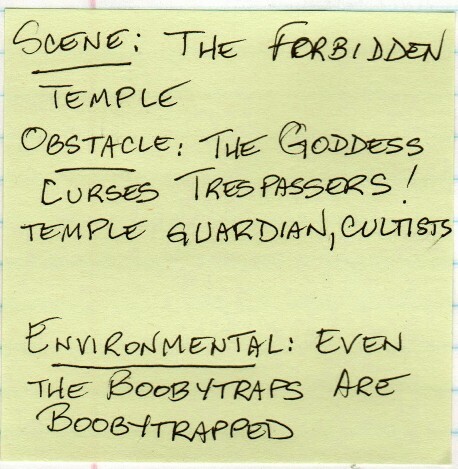 Write two for each scene: one for the location/setting, and one for the obstacle the PCs will face. You can write more, but include at least these two. If the PCs will face no obstacle, then there is no tension. The scene will be boring and you need to delete it from your list. Even searching an abandoned war camp for information is an obstacle, Hidden Clues. Kim thinks about who stole Valius Nummus’ manuscript and how hard it should be to track them. She wants to bring in some physical confrontation early on and also point to the waterfront so Isaac, whose character Ulf is not directly tied to the Mask of Kuldarus, will not be left out. Combat: Governs NPCs attacking, defending and creating advantages using combative maneuvers. Exploration: This sets the difficulty, or opposes, PC attempts to interact with, or move through, the environment, whether that opposition comes from an NPC or another obstacle in the setting. This covers movement, investigating clues, discovering details, determining NPC initiative, allow something to remain hidden from the PCs, etc. Interaction: This is rolled to have the NPCs interact with the PCs. Lore: Governs how difficult it is to know some relevant information that comes up in the adventure. To set the adventure’s approach ratings, set two of the above skills at the same level as the PC’s highest approach rating (called Average Difficulty), then choose one to be +2 higher than that (called Hard Difficulty) and one to be -2 lower (called Easy Difficulty). For instance, if the PCs’ highest approach score is Good (+3), then you’d have a set-up of +5, +3, +3, +1. If you have an experienced group of PCs that have raised their approaches to Great (+4), then you would have a spread of +6, +4, +4, +2. Choose the scores so that they highlight the important aspects you have in mind for the adventure. Do you want this adventure to be a tough fight with low social interaction? Have Combat be your Hard approach and Interaction be Easy. Do you want a game of intrigue with next to no fighting? Use Lore or Interaction as your Hard approaches and Combat as your Easy approach. This is what you’ll be rolling for every NPC or setting element that comes into play against the PCs. The campaign is just beginning and the PCs top approach score is Good (+3), so Kim gets to assign +5, +3, +3, and +1 to the adventure “approaches.” She doesn’t want to make it too difficult to find the mask, so she sets Exploration at Average (+1), and she wants a lot of the questions left at the end to revolve around motives and factions, so she sets Interaction at Superb (+5). Combat and Lore will thus be at Good (+3). One or two players: One bonus stress box. Three or four players: Two bonus boxes. Five or more players: Three bonus boxes and one bonus mild consequence. If you find that too easy for the players, consider moving to the next increment; for example, if your four players are having too easy a time, treat them like a group of five or more, which will result in one more check box and one more mild consequence. Use of these vital stats is identical to how they are used for a player. Any time an NPC, environment, etc., takes stress, it subtracts from the adventure stress track, which replenishes at the end of the scene as usual. When the adventure is taken out, the GM can opt to keep the scene in play a little longer by filling one of the adventure’s consequence slots. No recovery check is necessary to begin the healing process of an adventure consequence—all that is needed is time. Of particular note are severe consequences. These remain for the rest of the adventure, but don’t follow into the next adventure. This means that if the GM has not used it by the end of the adventure, he has a basically free use of a severe consequence for the climax. This has the effect of making the climax last longer and become more difficult to overcome, which is a good thing. Tension should be higher in that final scene. Kim has three players so the adventure will have five boxes plus one mild, one moderate, and one severe consequences. 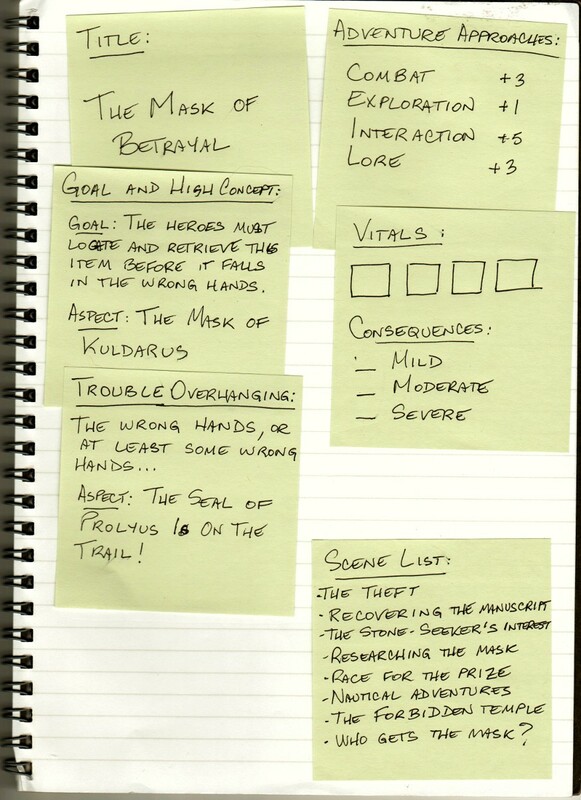 Instead of using large numbers of huge stat blocks and individual vital scores to keep track of, the GM records the name of the NPC, one or two aspects (which can be borrowed from the adventure/scene aspects), and a description of what they are skilled and bad at, necessary to set the NPC or location apart from the rest of the adventure mechanically. Go through your obstacles (one of the aspects you created for each scene) and create one or more stunts to represent that obstacle with reliable mechanical effects. 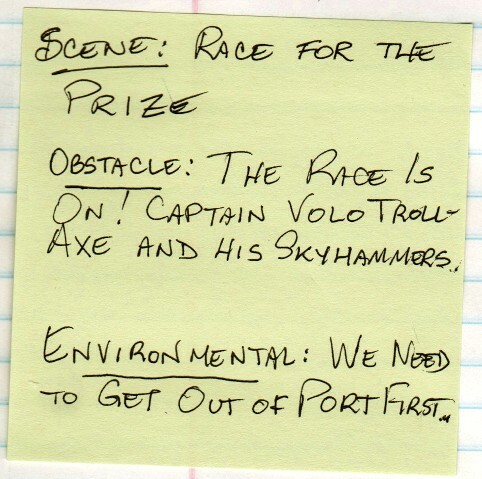 The choice of stunts is what will make each of the opponents and obstacles feel different despite sharing adventure approaches and stress track. In this adventure, Kim knows she wants Laetitia Bibulus and Captain Volo Troll-Axe as antagonists during the race to get the mask. She has also listed as “live” opponents the cheap hired thugs who are Skilled (+1) ganging up, scaring innocent people, and Bad (-2) at thinking ahead, fighting when outnumbered; and a tentacled sea monster who is Skilled (+2) grabbing people off ships, sinking small boats, and Bad (-1) at everything else. Finally, she wants the environment of the Forbidden Temple and its surroundings to be very hostile, so she stats it like an antagonist and she gives it the stunt Skilled (+2) at creating physical danger advantages using Exploration. That’s it! You have your completed adventure, ready to share with your players. Don’t forget to roll with their punches, and keep things fluid. Like most good outlines, this one is subject to change at a moment’s notice. Don’t force the issue of your perfectly devised plans. If the PCs get off-track, find a way to get them back to their goal—the adventure’s trouble aspect, the reason it was inevitable or imperative that they pursue the goal, is a good motivator to get them back on track. But if they are merely pursuing the goal in a way you had not expected, let them! 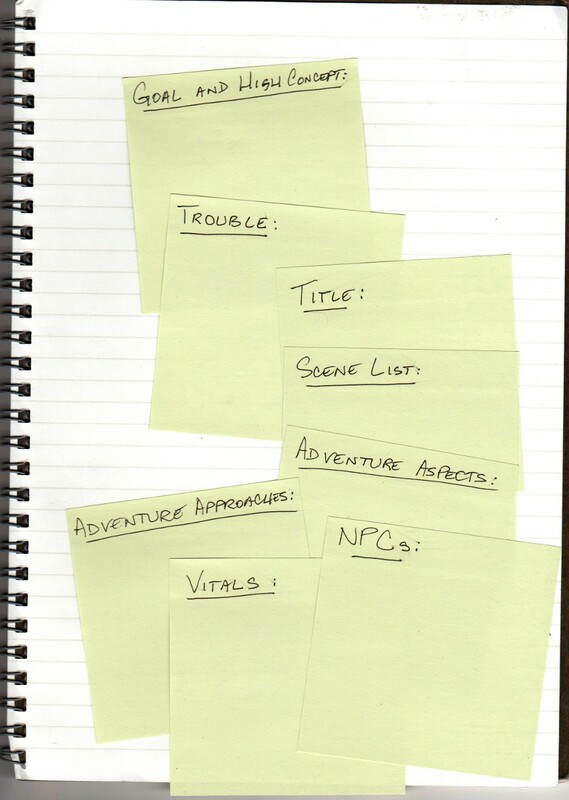 Once you grasp how it works, the Fractal Adventure format is quick and straightforward to use when creating scenarios. The unified view makes it easy for the GM to react quickly since there is no sheaf of notes to thumb through, and having the adventure statted like a character makes the GM more like another player at the game table, less like the CEO of the gaming group. On the other hand, some people prefer to this distance between the roles of GM and player. Others may find it conceptually difficult to treat the adventure as a character but the opposition’s actual characters as just features of the adventure. Finally, if you are comfortable improvising in response to your players’ ideas, all you really need in an adventure is a strong opening situation that ties to one of your issues, and some good antagonist characters with agendas. The players’ interactions with these will create the fiction, the entire group will create scenes on the fly. Credits: Art © ZombieSmith 2013, used with permission. Posted on January 12, 2014 January 12, 2014 by mechanteanemonePosted in books, fiction, games, rpgsTagged adventure, Agaptus, books, design, Evil Hat Productions, fantasy, FATE, Fate Accelerated, fiction, games, miniatures, rpgs, scenario, WarOfAshes, weekend, writing. Can you go into more detail on how you use the approaches and vitals in an adventure? I saw that you also gave individual NPCs stats, so do those get added on to the adventure approaches, or used in place of them when available? 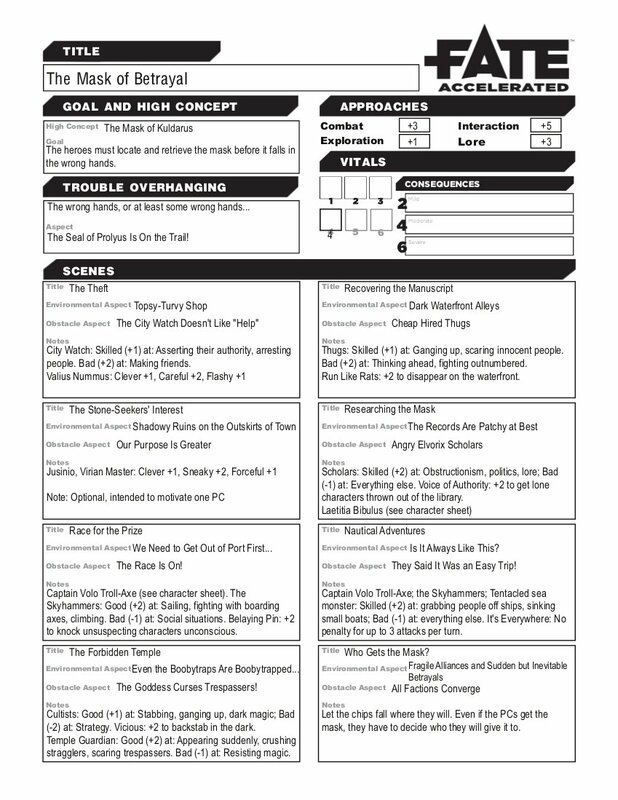 As far as the vitals go, I haven’t tried running a session with this worksheet yet, but having just one vitals track for how ever many opponents are up against the group seems really under-powered, even if the stress is increased per PC. Was this the intent? Do you find that it goes differently? There is more discussion in “War of Ashes,” and much of it should be released as Open content by Evil Hat Productions later this year. Just wanted to say thank you for the detailed write up. This has made my prep much easier. Can you clarify how the Adventure Approaches modify opposition? In the example if Combat is +3 does that get added to each Minion’s combat relevant approach (making them +5) or does that suggest key combat scenes should be frequent with at least one opponent with a +3 approach? Hi, Rob! This was an early version of the idea, and still a bit nebulous. Fully-statted NPCs, i.e., villains and henchmen, use their own approaches; inanimate opposition, minions, and swarms use the adventure approches and their own skill modifiers. For more info, the new rules for War of Ashes:Fate of Agaptus are available on the Fate SRD site; here is the direct link to the full adventure construction chapter: https://fate-srd.com/war-ashes/adventure-creation-expanded. You can also get a PDF version of the book as pay-what-you-want on DriveThruRPG: https://www.drivethrurpg.com/product/157134/War-of-Ashes-Fate-of-Agaptus.